Police Officer Sharpe and Mr. Tomei of the Nassau County Police Department visited Viscardi today to talk with students about careers in the NCPD. Police Officer Sharpe talked about what it is like to be a Police Officer. In addition, she described the career opportunities available in the NCPD. 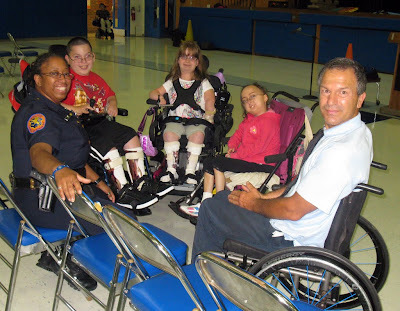 Mr. Tomei spoke with the students about opportunities available for people with disabilities within the NCPD. Police Officer Sharpe and Mr. Tomei responded to questions from our students. Prior to speaking with the students, Police Officer Sharpe was presented an award recognizing the role the NCPD has played in helping Viscardi at different times, such as 9/11. We thank Police Officer Sharpe and Mr. Tomei for taking the time to visit with us.